As teachers, we stand in a lecturer theatre or in a seminar room, and teach, lecture and seek to inspire our students as they listen to us transmitting our knowledge, our expertise and our stories. That is what we do. We accept the rooms we are allocated and the time slots we are given. We cannot get involved in timetabling or room organisation. And, it does not matter anyway, - time and space - because we are asked just to teach, right? Well, NO. One thing that organising a role play game has taught me is the importance of space and time. Perhaps for traditional forms of teaching such as lecturing, the organisation of space appears less important because students sit in such a way that they listen and absorb what the teacher has to say. Perhaps for traditional forms of teaching such as seminars, time slots cannot be increased because the normal 50 min slots where presentations are made, discussions are held and conclusions elaborated works for what is required. But maybe we need to think again. Getting the right room and amount of time for a role play is key to its success. Let's start with room space. For traditional teaching, a teacher at the front with desks all facing forward is seen as a classic and useful set up because one person has to teach and hold students attention at the front. However, this classic set up, already does not work for seminar presentations or discussions because it can be seen as rather aggressive and unconducive to productive and free flowing discussions among students. Chairs organised in a circle, away from desks, somehow break the tension and create a friendly and participant atmosphere. For role play games, room space is just as important because it is a game that needs to be played and acted out. The room becomes a theatre, students become the actors, and so, they need to move around, they need to act out situations, they need to engage with other groups, they need to talk among themselves. If the actors are on top of each other, they feel their acts are more constrained and limited. 'We overheard what they said' said one student because the space was too confined. That overhearing preempted a possible reaction by the group that overheard and therefore the game could must be as natural as it should have been. There needs to be enough space or the right amount for students to be able to act out their parts and regroup without overhearing the plans and next moves of other groups. For role plays room space becomes vital for the success of the game but there is a more general point about how we must use room space appropriately to achieve our teaching objectives. I think that we some times forget this and accept what timetabling give us, perhaps because we are lazy, perhaps we just do not think about these important considerations. We can no longer do this because students deserve better but also universities now have such brilliant facilities and rooms that we need to make sure we just them effectively for the right teaching methods. 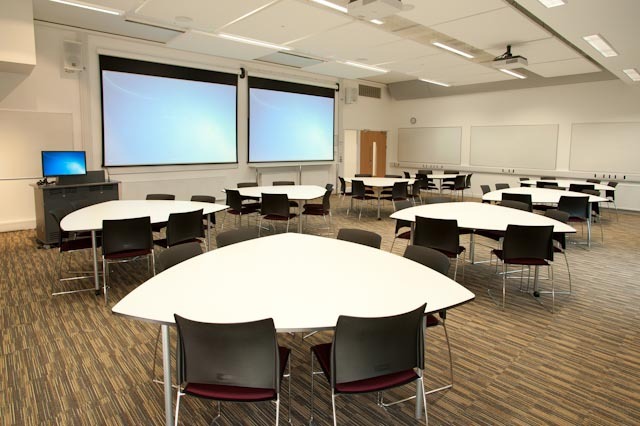 At the University of Bath, we have some fantastic rooms in the new Chancellor's building on the 4/5 the floor, which not only have great views of the Chilterns but are made for role plays, big, spacious with lots of light and work tables. All this to say, we must use our teaching environment to make sure that we can achieve our teaching objectives. On too many occasions, I have had to chair seminar discussions in lecture rooms with the traditional set up, we must move away from this. Time is also fundamental to teaching objectives, less important that room space but something to consider. Each university has its own allocated time slots, usually under an hour, with a few minutes for students to move from one lecture to another. For role plays, it is the same. Time is needed to play the game. It cannot be rushed because students need to think and discuss their reactions before they act them out. At first, I thought that we would have too much time but far from it. 2 hours worked well for our role play games not only was it the necessary time for students to act out their scenarios but it also gave us a precious 30 mins at the end. That 30 mins at the end, was the debriefing session and another key element to a successful role play. For the role play to make sense a debrief is mandatory for the students to reflect and analyse what has taken place but also to give the teacher the opportunity to stress the important aspects of the game and what lessons we can learn from it. The debrief is the teacher centered moment of the class where everything can be bought back, away from the game to the importance of the academic literature, having critical insights and developing analytical reflections. This can only work if undertaken in the right environment with the appropriate amount of time, only then can the teaching objectives work and there does not exist a disjuncture between the various elements. If teaching and reaching the learning objectives are not going as smoothly as they should, maybe space and time should be looked at.